Well, after a week that felt like an eternity, the Florida Panthers are off and running under new Head Coach Tom Rowe. By now, you are no doubt familiar with the rather unceremonious departure of Gerard Gallant, along with Assistant Coach Mike Kelly. The rationale and motivations for the move have been infinitely sliced and diced since, and no matter how anyone feels about it, life in South Florida has gone on. This article isn’t about Gerard Gallant versus Tom Rowe. It’s not about analytics versus the old school. It is about organizational culture. There was, quite clearly, a vast chasm between Gallant and his style of play, and that desired by his management team. Tom Rowe, a former player and coach, was shoehorned into the management structure — what exactly is an “Associate General Manager”, anyway? — early last year. Gallant’s champion, General Manager Dale Tallon, was soon shuffled upstairs to President of Hockey Operations, with Rowe taking over GM duties. In the aftermath of the firing, it became clear to all what was already evident to many (see the July 6 episode of Marek vs. Wyshynski): Gallant was never the coach of choice for this front office, and that his imminent dismissal was a foregone conclusion. It was never going to be easy letting go of the guy who led your franchise to its best-ever regular season finish. But, if they felt that they had to get rid of him — and there was some evidence to rationalize such a sentiment, then that’s fine. However, there is a way to let someone go; this was definitively not it. To start, if they already knew they were going to fire him, why did they even bother bringing Gallant back this season? The fact that they did so weakens the organization’s case against him significantly. 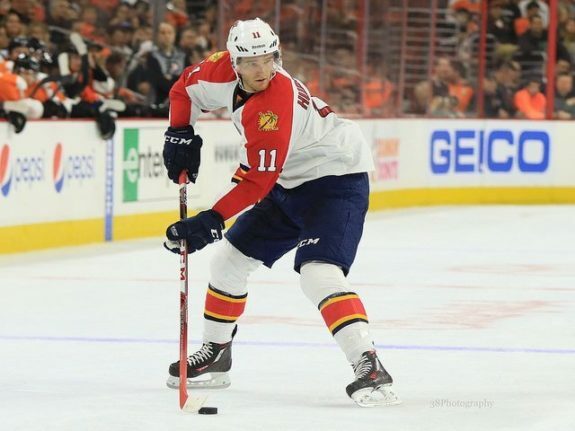 Surely, the Panther’s 11-10-1 start has little to do with the coach and everything to do with the bevy of injuries they’ve sustained thus far (Bjugstad, Huberdeau, Jagr, Jokinen, Petrovic…). Yes, the advanced numbers aren’t brilliant, but tell me how many teams missing half of their top six perform up to expectations. In addition, James Reimer, who — given the age of tandem partner Roberto Luongo — will be relied upon heavily for a significant amount of quality starts, hasn’t exactly been stellar between the pipes, either. No sane management group would begrudge a coach for a mediocre (two points out of the Playoffs) start under these conditions. Okay, so Gallant starts the season coaching the team. They’d been up and down through October and November, so any structural problems would already have been readily apparent. So why let Gallant embark on a six-game road trip? Okay, so maybe they were giving him one last chance to prove his worth. But why fire him after the first game of said trip, when they lost by one goal on the second night of a back-to-back? Okay, so the Panthers did lose after being up 2-0 in that game. But is that really worthy of dismissal? Okay, maybe you feel that it is. But why do it right after the game, when the team hadn’t even left the arena? Could it not wait until the road trip was over? Or at least until the team was back at the hotel? Further, why on Earth was it the owner making the call (by the way, Gallant was fired over the phone…)? I have a lot of respect for what owners Vinnie Viola and Doug Cifu have done in Florida. They have fostered respect for the Panthers around the league, doing away with often-embarrassing promotions and giveaways, and instilling discipline and order throughout the ranks. They have ensured that the term “laughingstock” no longer applies to their franchise. I am fully behind their passion for professional hockey in a skeptical, if not indifferent, market. My only question is what happens the next time Florida needs something — or someone. How about the next time Florida needs a coach and there is a Mike Babcock-esque candidate is on the market? Yes, the weather, and yes, the taxes (or lack thereof). But is a top-flight coach with the world as his or her oyster really going to opt for an organization that treats their employees like used Kleenex? The same goes for top-tier free agents: what will they think? The photos of Gallant and Kelly waiting for a taxi outside PNC Arena were unfortunate, to be sure. The Panthers did indeed call a car service for them, but the two left before it arrived. However, the Panthers do not deserve your sympathy for this bad PR. In fact, this isn’t even about PR, HR, or anything other than basic human decency. The Panthers lost this battle. Should they keep this up, they might just lose the war.